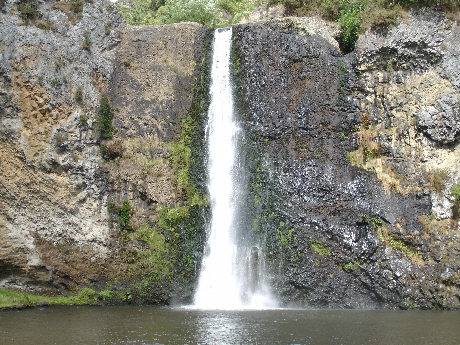 About 15-20 miles South-East of Auckland you can admire the Hunua waterfalls in the Hunua Ranges. 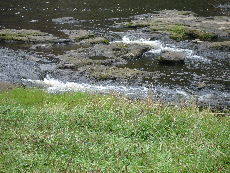 The Hunua Waterfalls are situated on the Wairoa River. 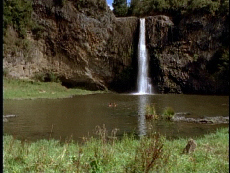 These waterfall have been used for a connection scene shoot in Mortal Beloved. But you already recognized it from the most well known episode with this waterfall : ALTARED STATES. Below you find some screengrabs and the original pictures taken. 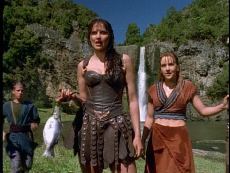 You can see more of it on the video at the video section of the Xena Film Locations. We visited it 13 years after the shoots and we surely can tell you that nature changed a bit. We had to search for the exact shooting angles to discover the exact filming place. Always have your Ipod with you so you can take a look at the episode screengrabs. That was a brilliant idee to take that along. 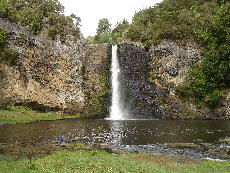 The Hunua falls from the episode. The place where I'm sitting is just behind Xena and Gabrielle. It is a very small area so once more the filming did a great job cause you do have the impression that the action takes place on a big grassy area. So it doesn't. You get a more clearly view with the video at the video section. You can easily go for a swim. I should do it next time cause when we visited it we had to many visitors. And when want to go for a Xena swim you have to do it relaxed. It is a marvelous place. As a Xena fans it makes that more beautiful. But the most exciting ting is that you are so near to a waterfall and that you can swim to it. I never experience this sight. It makes New Zealand more special.